Surprising as this may sound, I don’t always go see movies that are comprised solely of explosions and manpain. I mean, that is definitely the bulk of my movie-going experience, but not all of it, as it turns out. And it just so happens that the happy fun kids movies ask interesting questions too. Who knew? So today we’re talking about Despicable Me 2, the adorable sequel to the adorable original, which follows Gru, a reformed supervillain voiced by Steve Carrell, as he attempts to be a single-father to his three daughters and navigate life post-villainy. It’s cute. And squishy. And it gives you lots of warm fuzzy feelings, so that’s good. But it also asks some really surprisingly deep questions that I think are worthy of further discussion here. Namely, do the minions have souls? Okay, backing up for those of you who haven’t seen the movie or anything in this franchise. 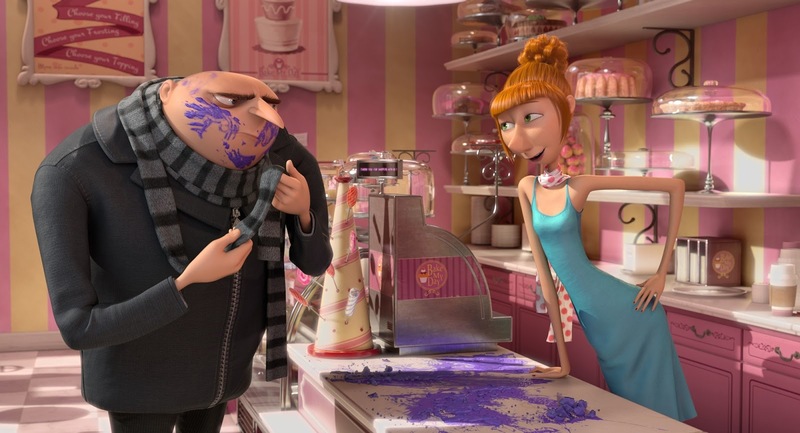 The whole story follows Gru, a stereotypical supervillain with tendencies towards mad science. He and his scientist friend have created an army of minions – little yellow pill shaped things that don’t really talk but do seem to be somewhat self-aware. 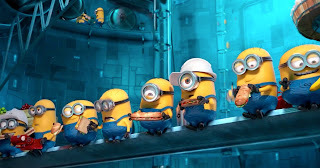 While the minions are mostly there for the comic relief and to do the grunt work in Gru’s lab, they also sometimes show up in the story. This is most evident in the sequel. 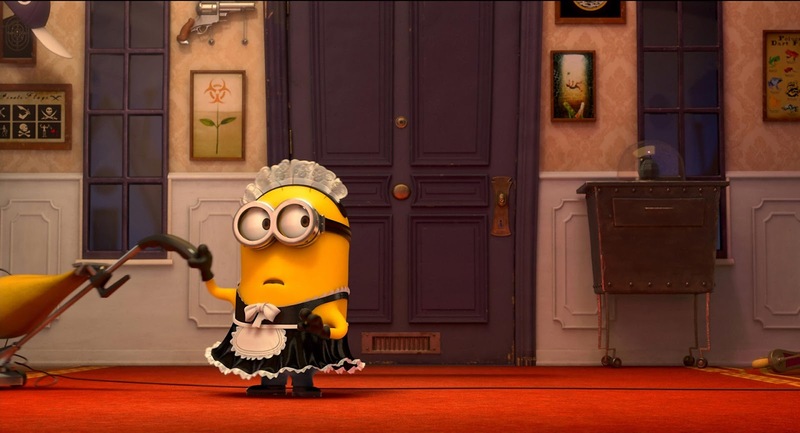 In this movie, the minions, which are just minding their own business, cleaning the house, making jam, and getting into kid-friendly levels of mischief, start disappearing. Gru thinks he’s just being overgenerous with the vacation time, but we as the audience know that something else is going on. It turns out that the minions are being kidnapped as part of an evil plot to turn them into indestructible killing machines that can take over the world. It’s a kids movie, so the whole villain plot and, well, most of the plot isn’t all that fleshed out, mostly there so that the comedic voice actors can grandstand in front of it, but the basic story is okay. What gets weird is how we’re supposed to feel about the minions in this situation. Look, there are two different ways this could go. 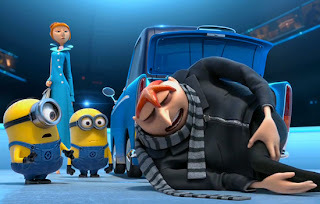 If the minions are just animals, on the level of dogs or cats, with some level of feeling, but certainly not the complex inner world of a person, then we can feel bad about their kidnapping and intended destruction, (destruction by the annihilation of their free will, that is), but we probably won’t be horrified by it. It’s just sad, and a reason why the bad guy needs to be stopped. If, however, we think they’re people, then this is actually a pretty dark movie. And I’m pretty sure that’s the direction we have to go here. We see the minions working, but we also see them partying. And when I say partying, I mean having a complicated dance party, complete with drinks, refreshments, dancing, and a certain amount of social awareness. We see the minions happy, sad, angry. We see them react to the world around them in ways that suggest personhood. We even see them present identity and gender with regards to their clothing, and we definitely know that they have names. In short, I think they’re kinda people. Which makes this whole movie a lot more interesting. And a lot more creepy. Because if the minions are people, which they certainly seem to be, then the movie is about people being forcibly kidnapped, held hostage, then transformed against their wills into mindless killing machines. They are also sent against their former master/friend Gru and his daughters. So basically it’d be like taking an ordinary man, changing him, and making it so that he has absolutely no mind or purpose and he’s trying to murder his boss. We’re talking about brainwashing. And it’s creepy. But actually that’s what makes me like this movie. The movie itself is okay, but never really great. 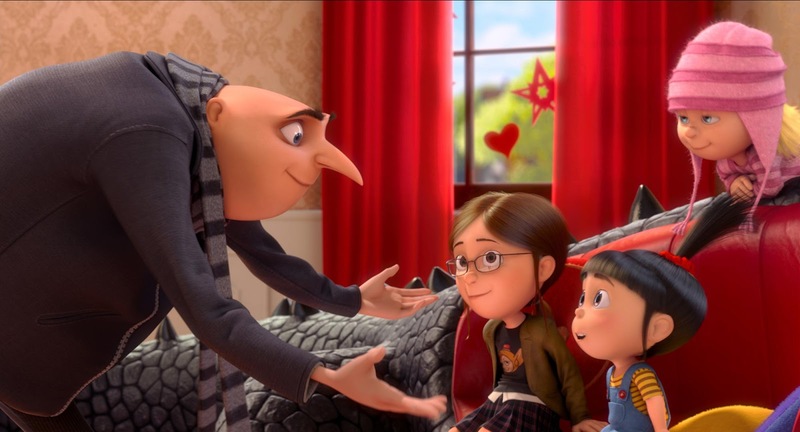 The story is pretty standard – now that Gru is ensconced in single fatherhood, the next logical step is for him to fall in love. Also, since he’s now a good guy, he should go on a good guy journey. And while the romantic subplot was reasonably well done, though Kristen Wiig’s Lucy takes a little bit to grow on you, the whole thing was just so…easy. Yeah. I think that was the problem. It was cute, sure, and pretty well executed, but the idea of a father seeing his daughter begin to date and freaking out that the boy must be evil – that’s not exactly original territory. Or having a single father afraid to start dating and his daughters trying to get him onto a dating site. Or him being constantly set up by the obnoxious neighbors. None of it’s bad, it’s just not very interesting any more. But minions and questions of personhood and brainwashing? That’s new. That’s different. And that is really interesting. So go see Despicable Me 2 if you are so inclined. If you aren’t then don’t. It’s not a bad movie, and it does have its moments, but overall it’s not necessary worth the ticket. Wait for the inevitable Netflix release.